Sound Isolating sleeves in multiple sizes provide up to 37 dB of isolation and a customized fit. Shure SE215-CL Sound Isolating Headphones/Earphones with Single Dynamic MicroDriver. Sound Isolating Earphones. Sound Isolating sleeves in multiple sizes provide up to 37 dB of isolation and a customized fit. Shure SE215-K Sound Isolating Headphones/Earphones with Single Dynamic MicroDriver. Sound Isolating Earphones. Tested 100% Work Sounds Excellent !! 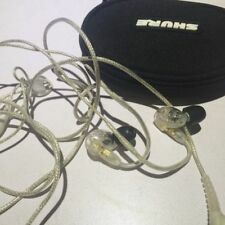 Shure SE215 In-ear Headphones with Extra Cable. Comes with box, pouch, and ear tips. Everything works great. Condition is Used. Shipped with UPS Ground. AUTHORIZED SHURE DEALER! FACTORY SEALED! WARRANTY! Shure SE215. No local pickup service. Headphones/Earphones Black. If you have any problems, we are very glad to help you. Shure SE215 Sound-Isolating Wireless Bluetooth Earphones ,Headpones . Condition is New. Shipped with USPS First Class Package. 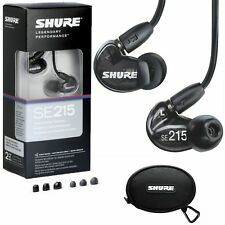 Shure SE215 Black Sound Isolating In-Ear Headphones Earphones. Condition is New. Shipped with USPS First Class Package. Model SE215. Sensitivity 107 dB. Impedance 17ohm. Available in wireless and wired versions with detachable cables in multiple color options. Special Edition (SPE) white and blue versions have distinctly tuned frequency response for extended bass. We want to hear what you have to say! 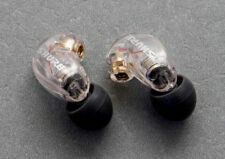 Shure SE215-CL Sound-Isolating In-Ear Stereo Earphones (Clear) . Condition is New. Shipped with USPS First Class Package. Ha ve s om e scuffa nd s om e le tt er of shure in t he earbuds wa s fa de d. No o ri gi na l po uc h. Sh ur e se 21 5, Black, preowned, t es te d an d wo rk f ul ly. SE215 Wireless Sound Isolating Earphones with Bluetooth Communication cable provide hour after hour of rich, detailed sound with enhanced bass, the freedom of wireless and simplicity of Bluetooth. SE215 Wireless Sound Isolating Earphones. Shure OEM SE215 SE315 SE425 SE535 Carrying Case Pouch - Excellent!! 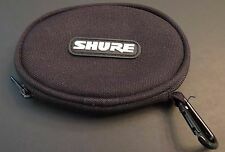 Up for sale is one Shure OEM Carrying Case Pouch for SE215 SE 315 SE425 SE535 and other models in Excellent Used Condition. Shure SE215 Bundle With Westone Bluetooth Cable. Condition is used but good. These were my daily-use earphones until I upgraded to the Sennheiser True Wireless. Sound is excellent, with quick, full bass. Comes with Shure cable, carrying case, and Westone Bluetooth cable. No eartips though because ew. Shipped with USPS First Class Package. Good working condition with S hure RMCE Remote & Microphone MMCX Cable. Sound Isolating sleeves in multiple sizes provide up to 37 dB of isolation and a customized fit. Shure SE215-K-UNI Sound Isolating Earphones with Inline Remote & Mic for iOS/Android, Black. Sound Isolating Earphones. SE215 Wireless Sound Isolating™ Earphones with Bluetooth® Communication cable provide hour after hour of rich, detailed sound with enhanced bass, the freedom of wireless and simplicity of Bluetooth. Sound Isolating™ design featuring comfortable sleeves that block up to 37 dB of ambient noise for extended listening, without distractions. 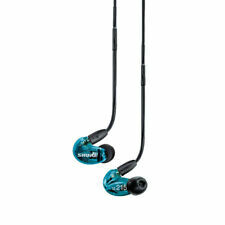 Optimized for Shure SE earphones with detachable cables, including SE215, SE315, SE425, SE535 and SE846. 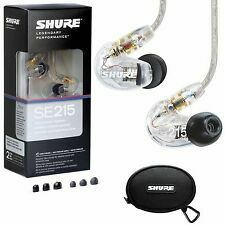 Compatible with Shure Earphones models; SE215, SE315, SE425, SE535 and SE846 (earphones not included). Trending at $69.89eBay determines this price through a machine learned model of the product's sale prices within the last 90 days. Sound isolating™ design. Sound signature: Detailed sound enhanced bass. YOUR BEST SOURCE FOR PRO AUDIO GEAR. Sound Isolation (up to): 37 dB. Dynamic microdriver, newly tuned for extended low frequency response. Shure SE215 Wireless Sound Isolating Earphones with Bluetooth - Clear. Are you wanting excellent earbuds and not looking to spend a fortune?. Check out the SE215 Wireless Sound Isolating Bluetooth Earphones from Shure.